Saint Laurent is a grape you probably have never heard of unless you travel to Eastern Europe. I first encountered it in Prague last summer where it is sold to Americans as a local, cool climate substitute for Cabernet Sauvignon. It is the most widely planted grape in the Czech Republic and is prevalent in Austria but I had never seen it in the U.S. until I came across this small producer in Sonoma who has, as far as I can tell, cornered the market in the U.S. Dark berries and cranberries meld while intense coriander highlights and violets give the wine warmth. These are focused aromas against a hazy vanilla background–quite mysterious, a bit like Syrah in its fruit-spice-floral mix. The palate opens with bursts of high toned yet restrained acidity resting on a lovely, soft velvet texture with some ingratiating oiliness, really an intriguing textural contrast. The palate flavors show bright red fruits morphing into blood orange as it evolves in the mouth; the tannins are very fine forming a bed of light powder under the more persistent, tangy acidity. This achieves a lovely balance of incisive, taut top notes and a tender, seductive foundation, like a perfect marriage of the best aspects of Syrah and Pinot Noir. And the alcohol comes in at 12.5%, almost unheard of in California red wine. The grapes are sourced from the Ricci Vineyard in Carneros. Not much is known about the origins of St. Laurent although the speculation is it’s a natural mutation from Pinot Noir originating in France. 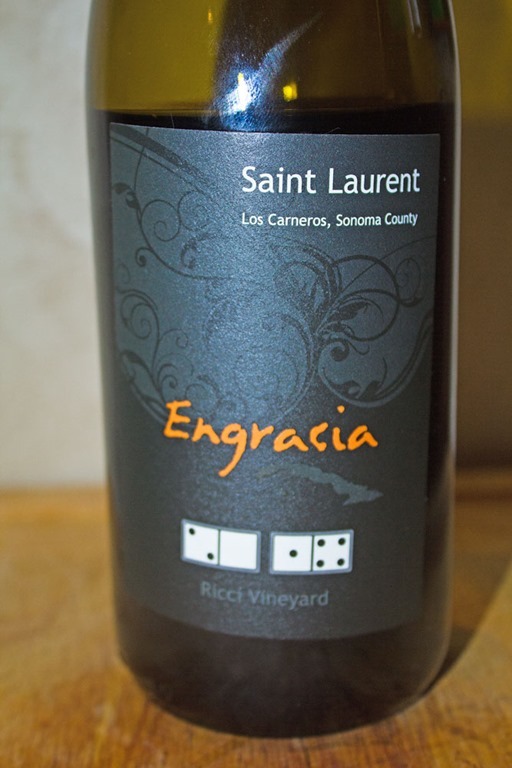 Engracia owner and winemaker Mike Faulk has done an outstanding job with this little known grape which has a reputation for being difficult. If other producers can unlock more of it’s secrets (and more vineyards decide to plant it) it has a real future in the U.S. This bottling will be available soon from Engracia; in the meantime try their lovely Pinot Noir and Chardonnay. The gentle, floating-on-air quality of Letting Go by Nitin Sawhney captures the textural dimensions of this wine.